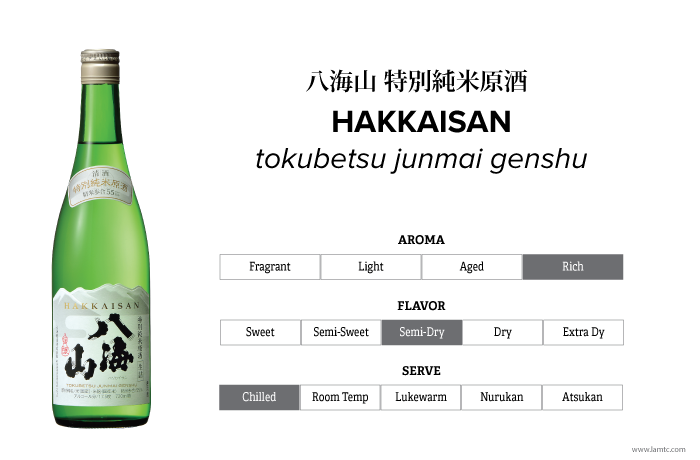 Hakkaisan Tokubetsu Junmai Genshu stands out for its light, but deep, flavor. Slowly fermenting the mash at low temperature gives this product a full-body and elegant bouquet. Retaining its full flavor and refreshing scent when chilled, this Sake was made to be enjoyed at various temperatures - even negative (below freezing) temperatures are worth trying. To create your own Slushy Sake, bring Hakkaisan Tokubetsu Junmai Genshu down to -12°C (10°F), and serve 1.5 - 2 ounces in a well-chilled shot glass. Enjoy the smooth scent of Sake and a refreshing feeling you won't find in beer, highballs, or other carbonated beverages.